Today was a Movie Marathon for me where I watched 3 movies back to back. It's time to review them one by one. Starting with the one I watched first, "Dum Laga Ke Haisha". I was recommended this movie by many but unfortunately, the plan kept getting postponed. Today, after watching this movie, I wanted to meet Yash Raj guys and ask them why don't they produce and make movies of this kind. What an enormously sweet and charming movie Dum Laga Ke Haisha is! The director, Sharat Katariya, also the writer of this movie, has given us a movie that makes us feel bad for the kind of movie we have to see these days where such movies go unnoticed. The film is beautifully written and every scene is put perfectly which makes the movie look so easy yet so effective. The best part about the movie is that every scene, dialogue and character is in touch with the reality. No where will you feel that a particular scene or incident is exaggerated according to cinema. It seems as if you are watching a theater act and that's what makes this film more beautiful. The chemistry between both the actors is another USP of the movie. They have wonderfully enacted their relationship and how it deals with various problems because of differences in education and lifestyle. Ayushmann Khurrana have definitely proven everyone wrong who felt he shouldn't act anymore after Hawaizaada. His frustrating character is very well portrayed by him and he makes you laugh many a times. 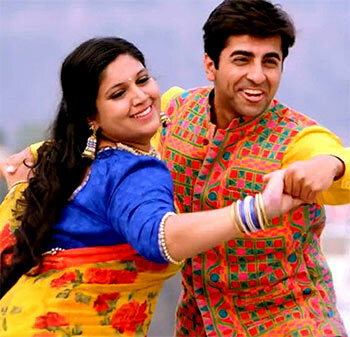 :-) The actual star of this movie is Bhoomi Pednekar who have played the role of overweight wife. Even that isn't stereotyped in the movie. They have shown how she is comfortable with her weight and isn't going to sit quiet if her husband or in-laws goes the other way. It feels so fresh to watch a movie based in mid 90s where Kumar Sanu's songs are heard quite often. Both the songs sung by Kumar Sanu and Moh Moh ke Dhaage is melodious. The climax is beautifully put and makes you connect with the emotions of both the characters. And Yes, I shouldn't forget the wonderful comic performance given by Sanjay Mishra who plays Ayushmann's father. Dum Laga Ke Haisha is a very fresh film which is definitely giving its audience a wonderful experience and therefore, I shall recommend all of you to watch it. I give this movie 3.5 stars out of 5.